Berthoud Pass is the main gateway to the Winter Park area off of I-70; it's a well-maintained mountain highway that showcases the Continental Divide in all of its glory. Berthoud Pass is a popular destination for backcountry skiers and snowboarders, with 1,200 skiable acres of off-piste terrain. Use caution, as this is not an operating ski resort, so any activities are performed at your own risk. This mountain pass is the main gateway to the Winter Park area. 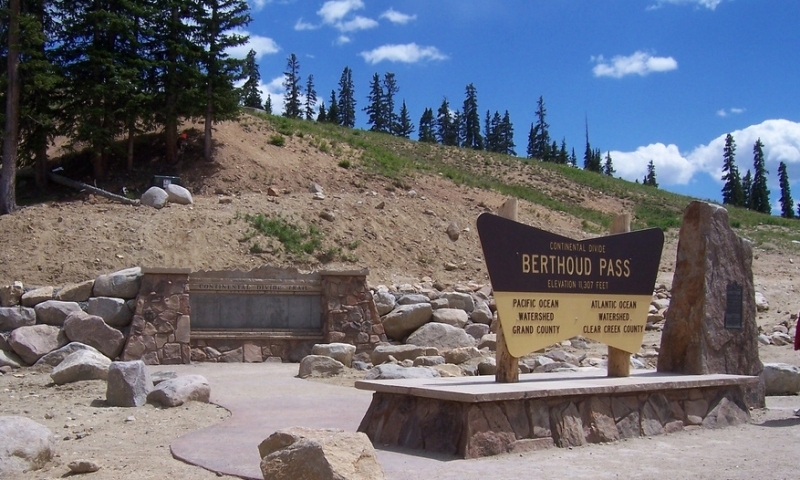 Berthoud Pass itself is a well-maintained, but switchback-laden mountain pass that leads directly to Winter Park and of course, its main draw, the Winter Park Ski Resort. After ten years or more of road improvements, this old 2-lane highway has been transformed into a 4-lane alternating highway that is now more conducive to the high number of travelers this road sees year after year. This high mountain pass is located west of Denver, Colorado and is located on the border of Clear Creek County and Grand County; it's in the Rocky Mountains, traversing the Continental Divide at the Front Range. It is the route of US Highway 40 (north of I-70), and it is provides the quickest access to Winter Park, and it is an alternate route to Steamboat Springs from Denver. From I-70, take the 232 exit indicating US-40 W to Empire/Granby; stay on US-40 W and you'll head straight over Berthoud Pass into Winter Park. It should take about 29 minutes to drive the 24 miles, in decent conditions. At the top of the Pass, there are restrooms for travelers; this is a popular destination for back-country snow enthusiasts, and there's a parking lot that abuts up to the mountain slopes. This was once an operating ski resort, opening in 1937, but it closed during the 1993-1994 season due to financial reasons, and in recent years, the ski lifts and lodge have been taken down, leaving a pristine wilderness area in its place. Skiers and snowboarders particularly enjoy the terrain that surrounds this area, with about 65 advanced to expert slopes on 1200 acres. Though the ski resort is closed, it's still easy to find the runs, and backcountry skiing and snowboarding are primary activities. Most of these enthusiasts drive to the summit, park in the lot, and then hike to whichever area they decide to ski down. You'll often see these skiers and snowboarders vying for a ride back to the top. Snowshoeing and cross-country skiing are also popular activities in these areas, and once you leave the top of Berthoud Pass and start traveling toward Winter Park, there's a pull-off on the 2nd to last curve where you can pick up the main trail called "Second Creek". Snowshoe or cross-country to the top and you'll find a small, rustic hut where you can rest and eat a snack. Caution should be exercised with any activity given that this area is considered the back-county, and without any ski patrollers formally roaming the mountain, have fun but know that you proceed at your own risk. The entire Berthoud Pass drive is a scenic masterpiece, as you'd be hard-pressed to find another mountain pass with as many waterfalls and a traversing course that showcases the mountains in a different light from every curve of the road. At the top of the pass, there's a sign indicating the elevation of 11,307 feet, and with the Continental Divide as the ever-extending backdrop, there are endless photo opportunities. It was named after Edward L. Berthoud, the chief surveyor of the Colorado Central Railroad in the 1870's; after surveying the road, he decided it was more suitable as a wagon road than as railroad, due to its steepness and tight curves. Pretty mountain drive near Breckenridge Colorado. Vail Pass is a high point along I-70 in Colorado.